Today’s ride: Two Rivers is a relatively new ride, starting and finishing in Centreville on the Eastern Shore. The two rivers are the Chester River and the Corsica River. 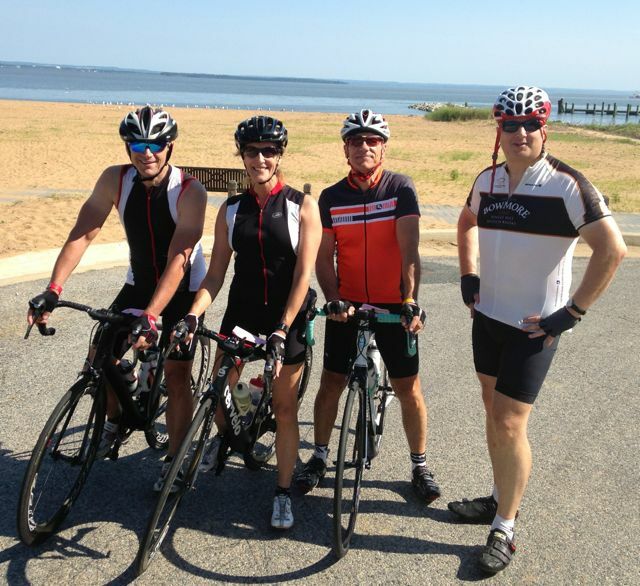 The ride crosses them, and gives beautiful views of the water and farmland surrounding Centreville and the Tuckahoe State Park. This is a fairly flat ride but there is a lot of variation, shaded areas, and quite a bit to see. The roads are good and in places the roadsides are taken over by colorful patches of wild day lilies. The ride support is good, and the rest stops are placed closer near the end of the ride. The road is well marked, and every turn has a sign! This is the kind of century that is pleasant to spin through, and since Centreville isn’t very far from the Bay Bridge, the Metric Century Option would be attractive for people who are training for a full century in the fall. The Experience: Today my usual riding companions split into two groups, with Bill Harback, Denise Teeling and Tom Roman in the “fast” group, and Ron Tripp, Eric Sanne and I riding a little slower. We rolled out about 7AM and while the morning was still cool we crossed over the Chester River and headed out toward Betterton Beach. Our pace was very consistent, and we found ourselves heading through the Eastern Shore countryside, talking and enjoying the morning. By the time we had gone 60 miles, the morning was heating up, and hydration was important. We had been good about drinking though and we found ourselves working together well. At the 75 mile rest stop we filled our bottles with ice and added water. When the temperature tops 90 degrees, ICE IS NICE! The cold water kept me from overheating. The rest stop in Tuckahoe State Park was beautiful, and though this was the first time I’ve ridden this century, I was very impressed by the ride. It was one of the best Eastern Shore Centuries that I’ve ridden. After the ride – lemon ice at the finish, and M&Ms out of the ice chest! 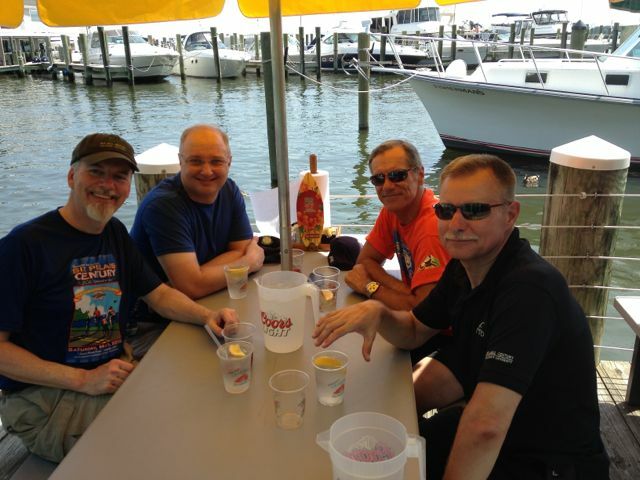 The experience was topped off by a great post-ride meal at the Fisherman’s Crab Deck on Kent Island, where we had a toast to those who couldn’t join us! Selections from my mental iPod during the ride: This ride was dominated by “Rain in the Summertime” by The Alarm, but also: “Caribbean Blue” by Enya, and “The Ghost in You” by The Psychedelic Furs. Stats: 101.79 Miles ridden. A lively ride with good friends and some great views. 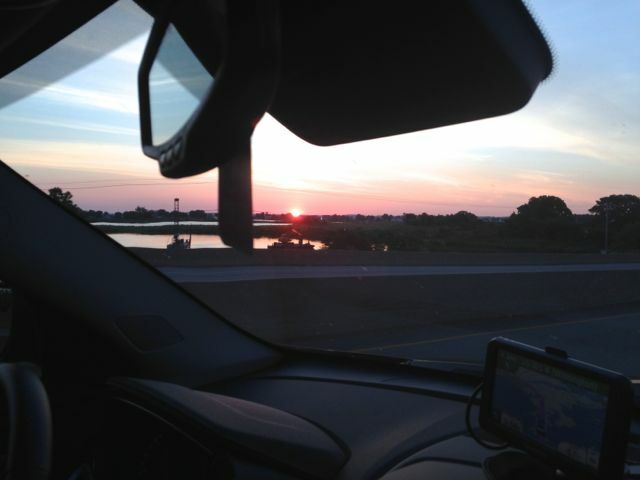 Sunrise – on the way to the ride start with Ron. 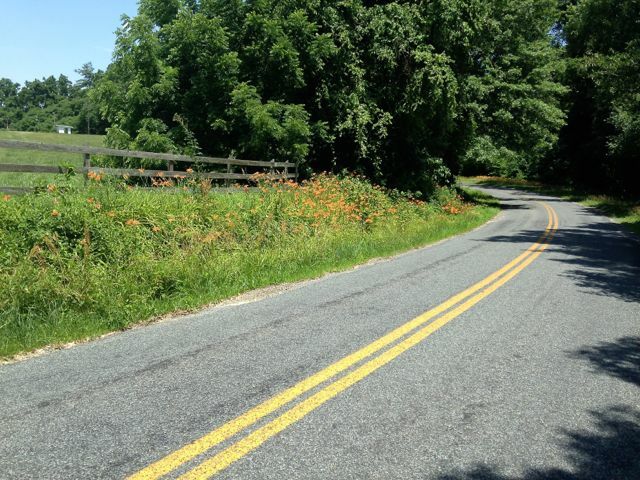 The scenery was great, and some of the roadsides had run riot with orange day lilies. 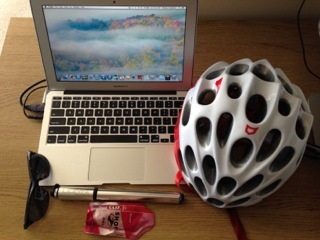 This entry was posted in Cycling on June 28, 2014 by kitefencer. Enya’s A Day Without Rain comes to mind. So happy you enjoyed the Two Rivers Bike Ride. A lot of planning and great volunteers made for a great ride. See you the 4th Saturday of 2015 for the 4th Annual Ride in support of the Wye River Upper School. So glad you enjoyed the ride and thanks for the nice comments. This was our third year and we are trying hard to improve each year. Wye River Upper School, a college prep school for great children that learn differently, sponsors the ride. “Because not all great minds think alike”. This year the Corsica River Conservancy co-sponsored the ride. We ride the 4th Saturday in June. Thanks also to Brian and Kim Billick who were our Honorary Chairs this year. They rode last year and again this year along with a group of family and friends.